ALL GENDERS WELCOME, LIMITED TO 15 PARTICIPANTS. WITH RAMANAND PATEL, DR. VELLEDA CECCOLI, RODNEY YEE, COLLEEN SAIDMAN YEE. It’s a sad fact that for many people the experience of early sexual trauma makes for difficulty in dealing with life. Since trauma resides in the body as a visceral memory, one can’t just “get over it.” According to yogic precepts, human beings experience life via the five senses and the thinking process. Traumatic experiences create memories that affect the way even new experiences are processed by the mind. In this residential retreat, Ramanand Patel will show us how yoga can help to deal with some of the experiences that interfere with daily living. This is done by re-establishing a safe relationship with inanimate objects, and then natural phenomena, plant life, animals, people, and finally the self. Once the strength of the ego is established by empowering the individual self, we will look at how the REAL SELF is free of time and hence free of trauma. Ramanand will work with the help of Doctor Velleda Ceccoli to create a safe atmosphere. 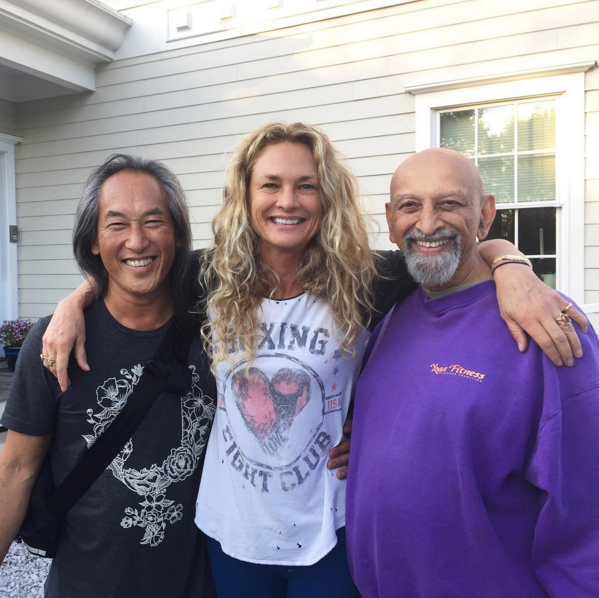 Rodney Yee and Colleen Saidman Yee will assist with the necessary support. TO REGISTER: We are only accepting 15 people. If you would like to be considered, send an application to susanliporem@gmail.com with a brief letter. You will then be scheduled for a 5 - 10 minute phone conversation with Dr. Velleda (therapist) to decide if this workshop is a good fit for you.